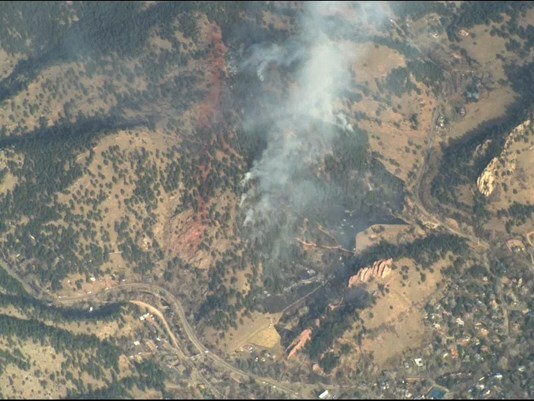 More than 400 homes are evacuated due to a wildfire burning in Boulder that sparked early Sunday morning The Boulder County Sheriff's Office says 1,000 calls went out to 426 homes during the pre-dawn hours. An additional 836 homes remain on the pre-evacuation list, which will only be evacuated if there is a major change in fire activity. The Sunshine Wildfire was reported around 1:40 a.m. and has since burned 62 acres near Sunshine Canyon and Timber Trail with 20 percent containment. Here's the visible satellite from Sunday, which showed mostly cloudy skies over the Twin Cities for much of the day, but we eventually cleared out, which helped boost temperatures into the 50s. There were a few locations in the southwestern part of the state that made it into the 60s! 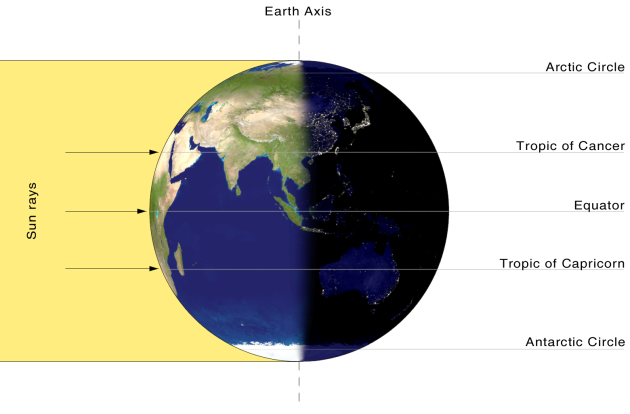 On Monday, March 20th at 5:29AM, the sun's most direct rays will be shining over the equator marking the beginning of spring in the northern hemisphere and the beginning of fall in the southern hemisphere. Note that the entire globe sees around 12 hours of daylight with the greatest increase in daylight occurring near the north pole. Get this, Barrow, Alaska is gaining a little more than 9 minutes of daylight right now, while Fairbanks, Alaska is gaining nearly 7 minutes of daylight. Happy Spring!! 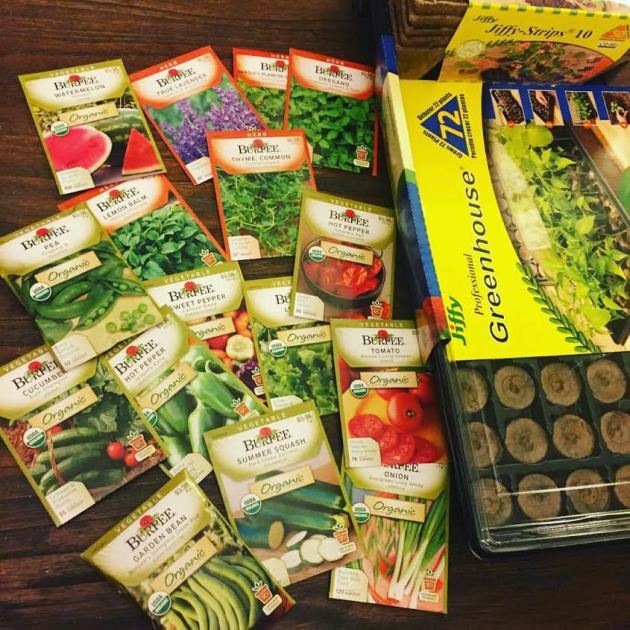 Thanks my good friend Kaley Jacobson for the picture below who is about ready to start planting seeds for the 2017 summer garden! While it's a bit too early to start most seeds, some can be planted now! If you're wondering when and what you can plant over the next few weeks, here a great seed planting guide from the University of Minnesota. Note that most seeds shouldn't be planted quite yet, but things like broccoli, cabbage, eggplant and peppers can be! And we're still a few weeks away from getting those tomato seeds going. Minnesota Arboretum: Best Botanical Garden in the Country? Well how about this... The Minnesota Landscape Arboretum in Chanhassen, MN is in the running for the best botanical garden in the country!! There's still time left to vote. "Visitors to the Minnesota Landscape Arboretum enjoy more than 1,200 acres of manicured gardens, woods and prairies, accessible via 12.5 miles of walkable trails and garden paths. The vast space, divided into 28 named gardens and 45 plant collections, showcases more than 5,000 plant species and varieties. Highlights include a Japanese Garden, Daylily and Chrysanthemum Walk, Kitchen Herb Garden, Maze Garden and Peony Walk." 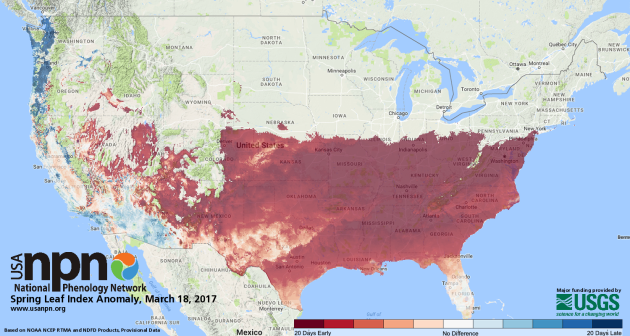 According to the National Phenology Network, spring has already sprung across a good chunk of the nation. In fact, much of the southern half the country is already reporting "the appearance of the first tiny leaves on the trees, or the first crocus plants peeping through the snow. The Spring Leaf Index is a synthetic measure of these early season events in plants, based on recent temperature conditions." The image below is the spring leaf anomaly, which shows that spring is still running nearly nearly 2 weeks or more ahead of schedule! According to NOAA's SPC, there is a risk for severe weather across the southern part of the country on Friday. Stay tuned for more updates. The extended forecast suggests a fairly stormy Friday across the Southern Plains. Strong to severe thunderstorms will be possible along with locally heavy rain. "California Highway Patrol finds Jeep buried under 20 feet of snow"
Dude, where's my car? Oh there it is! How about this story from out of California? A snow-removal vehicle was clearing roads in the Donner Pass and slammed into a Jeep that was buried under nearly 20ft of snow! Here's an excerpt from 3NewsNow.com: California Highway Patrol officers made a surprising discovery in the Donner Pass last week. Officers found a Jeep Cherokee buried under about 20 feet of snow near the town of Truckee in the Sierra Nevada mountain range. A snow-removal vehicle was being used to clear the roads when it slammed into the abandoned Jeep. 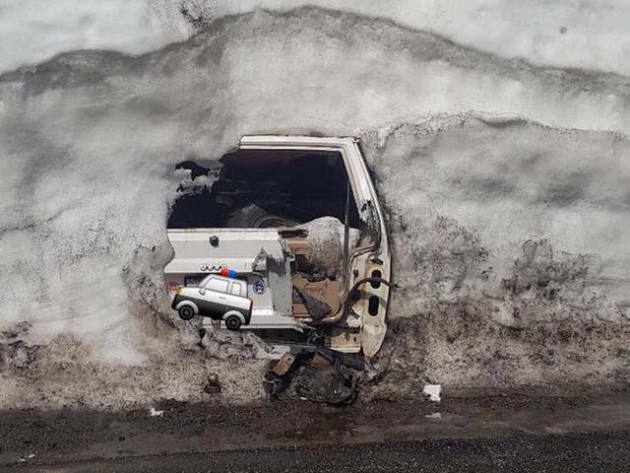 A stunning photo posted by the California Highway Patrol's Truckee division shows the vehicle's back end exposed amid a wall of snow. 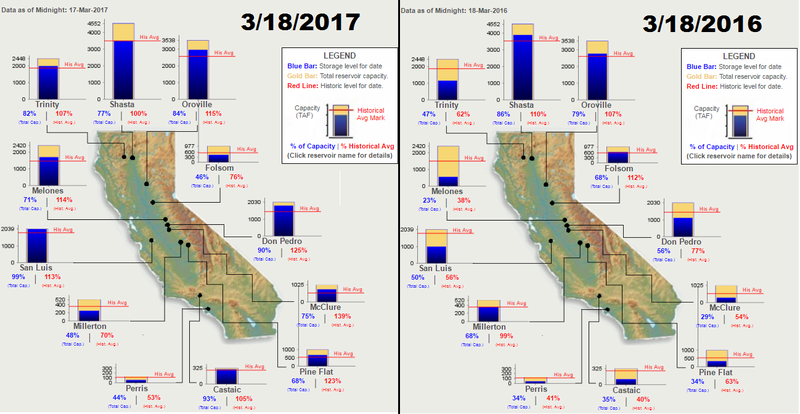 Take a look at the snow comparison from March 18th, 2016 vs March 18th, 2017. Note how much snow there is in the Sierra Nevadas this year! If you read the story above, the California Highway Patrol was reporting nearly 20ft in spots in the Donner Pass! WOW! Reservoir levels have certainly been coming up over the last several weeks/months, which is good news! Note that levels were quite a bit lower last year across much of the state, especially across southern California. Here's the weather outlook from Monday to Thursday, which shows another round of precipitation working into the Western US with some fairly decent precipitation tallies. Note that rain will be found in the lower elevations, while areas of heavier snow may be found in the higher elevations. 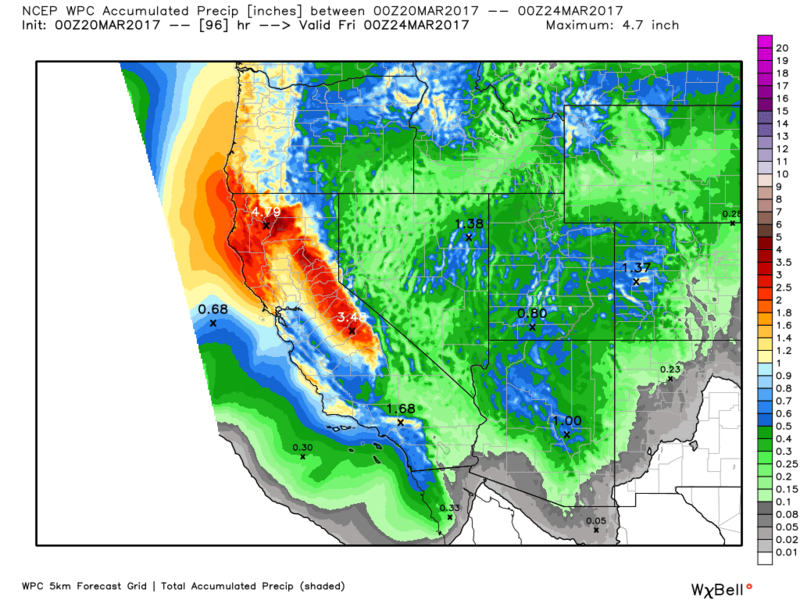 Here's a look at the precipitation potential through late next week, which shows another round of heavy precipitation moving through the Western US. Some spots could see as much as 2" to 4"+ of liquid. Here's a look at high temperatures from average on Monday. Note that while temperatures remain a little cooler than average in the Northeast, temperatures in the Central and Southwestern US will be well above average! Note that some locations across the Plains will be nearly 25F+ above average! With temperatures running nearly 25F+ above average across the Southern Plains, record high temperatures may be possible there. Take a look at the image below, which show the potential record highs (circled numbers) that could be set on Monday. By Todd Nelson, filling in for Douglas. Welcome to your first official day of spring 2017! How does it feel? Over the next 3 months, we'll see some pretty dramatic changes across the region as our dull, brown landscape slowly begins teeming with life. Note that the average bloom date of lilacs in the Twin Cities is around the 2nd week of May, so we've still got some time. With that said, if you want to get an early jump on the 2017 summer growing season, there are a few seeds that can started indoors now. Unfortunately, my poor wife has to live with a greenhouse in her kitchen over the next 12 weeks. Sorry dear. Weather conditions this week start off on a rather quiet note, but a soggy storm system blows into town later this week. At this point, I don't see much of a snow risk as temperatures will be hovering around 50 degrees. Keep in mind that the average high in the Twin Cities is now 43 degrees and will warm to 49 degrees by the end of the month! While it is still a little chilly for some, your boys of summer gear up for their home opener in just 2 weeks! Go Twins! TUESDAY: Partly cloudy, cooler breeze. Winds: N 5-10. High: 42. WEDNESDAY: Dry start. Wintry mix overnight. Winds: ESE 5-15. Wake-up: 19. High: 41. THURSDAY: Cloudy & mild. Scattered PM showers. Winds: SSE 10-15. Wake-up: 30. High: 50. FRIDAY: Windy. Steady rain in southern Minnesota. Winds: N 15-25. Wake-up: 37. High: 50. SATURDAY: Drier. Lingering clouds. Winds: ENE 10-15. Wake-up: 31. High: 48. 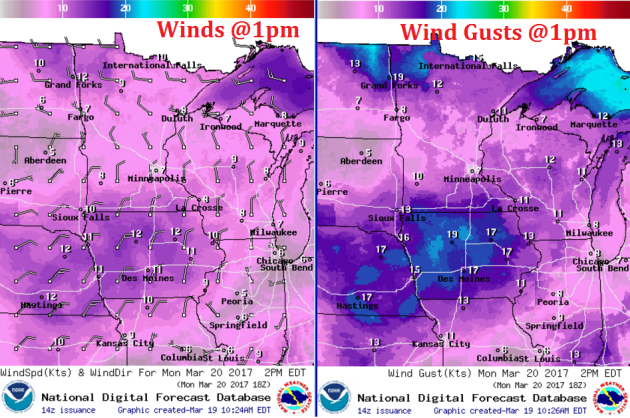 SUNDAY: Winds pick up. More rain late. Winds: SE 10-20. Wake-up: 35. High: 54. 1991: An early season tornado hits Faribault county from Bricelyn to Wells. 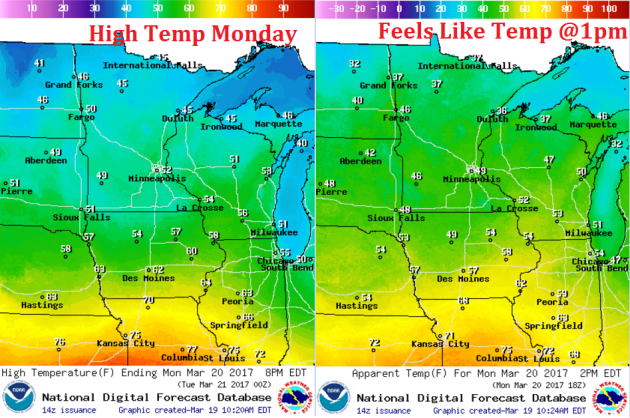 High temperatures on Monday won't be quite as warm as it was on Sunday. A cool front working through the region will pull temperatures down just a touch, but it will still warmer than average for this time of the year. After the passage of a cool front, winds will switch around to the north and drag down slightly cooler air for Monday. Note that winds don't look to be as breezy as they were on Sunday. Other than a few lingering cloud across the southern part of the state, much of the state will see sunshine once again. Last Day of Winter 2017. A shot at 60 degrees?